Mis Vacaciones en Madrid – My Vacation in Madrid – ¿Dónde Está el Baño? The week began with a sweet treat on lunes. Reed, Emily and I went to Sol where we sampled the “best napolitana in Madrid” at La Mallorquina. I’ve had my fair share of chocolate pastries and I have to say, this was up there! For weeks I’ve been telling myself to make better use of my Tuesdays and Thursdays as I only have class at 7:00 pm those days. This week I did just that. I visited two museums on martes. The morning was spent at the Prado exploring the new Goya exhibition and the afternoon was at Museo Arqueológico Nacional with the program. On the agenda for miércoles was a picnic in Retiro in between classes. Sofia, Reed, Emily and I went to the gourmet market by school to purchase crackers, chorizo, manchego cheese and the cheapest botella de vino available. USC must have known I was trying to do a lot in Madrid this week because they treated us to a flamenco show at Cardamomo. I have never seen live flamenco before and was blown away by how quickly the dancers moved their feet! Flamenco is powerful, emotional and energized, but not delicate. The dancers’ faces contorted into almost frowns as the passion flowed through their bodies. We were told that one of the dancers in the show, Paloma, is the best flamenco dancer in Madrid. To really have an authentic staycation in Madrid, I made my first trip to Kapital, a seven-story discoteca. I have to say I was underwhelmed, but that is probably because it was relatively empty. Thursday nights at Kapi just aren’t like Thursday nights at USC (not that I really go out there either…). I might return. I think it can redeem itself. Viernes rolled around and I could not believe I’d enjoyed an entire week of sunshine. Friends and I explored Parque de la Montaña where we admired the view and the Templo de Debod. We later reunited for gelato from Amorino and a stroll through Plaza Mayor. OK, so not the entire week was spent in Madrid. 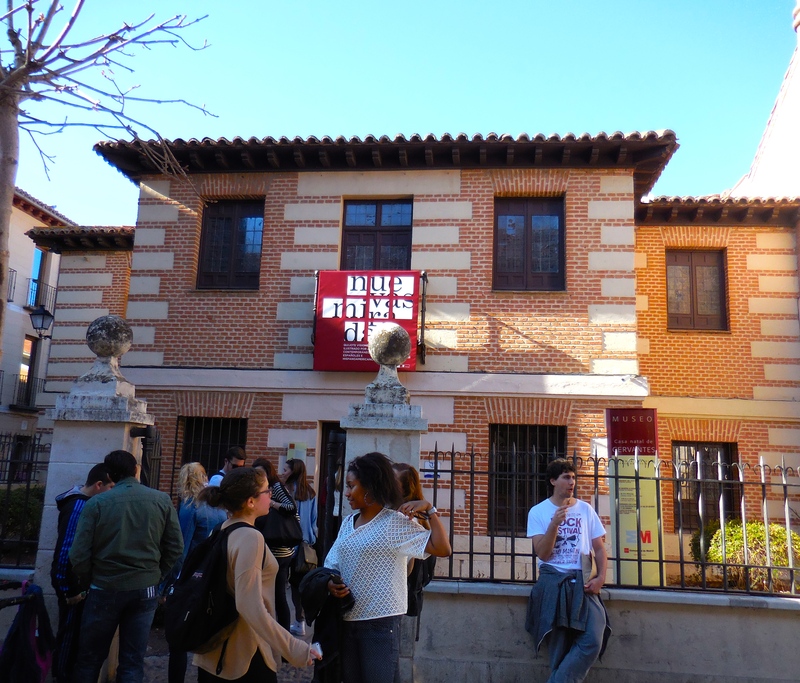 On sábado I joined my IR professor and some classmates on a day trip to her hometown of Alcalá de Henares. The small city located just 30 kilometers from Madrid is also the birthplace of Miguel de Cervantes. Between munching on breakfast, tapas and candied almonds prepared by cloistered nuns, we toured Spain’s second oldest university and Cervantes’s house. Fun Fact: Alcalá de Henares is known as La Ciudad de las Tres “Cs” for its many cloistros (cloisters), cárceles (jails that are no longer in use) and cigüeñas (storks). Alcalá has giant storks who make giant nidos on top of buildings. The nests are so large that it makes sense that people say babies come from storks. I could fit in those nests! Domingo arrived signaling the end of my vacation in Madrid.This week I felt lucky to rediscover some of my favorite lugares and find new ones, too. That evening I captured this gorgeous atardecer just around the corner from my apartment. What a perfect end to a perfect week. So glad that you stayed home and enjoyed Madrid! And I love the picture of you and your friends! This post was from me. I forgot to change the posting icon — silly Dad! I think I will hire you as my travel agent. I am learning so much about Madrid. It makes me want to go to Spain. Where are we going next? Hi Grams! Thank you for reading! I am a little behind on my posts, but you can be on the lookout for a recap of my weekend in 3 Spanish cities (Segovia, Salamanca and Avila) and another one about my time in Switzerland. I just got back today. Miss and love you!